A diary of my attempt to make an ethical housing choice in Chicago. 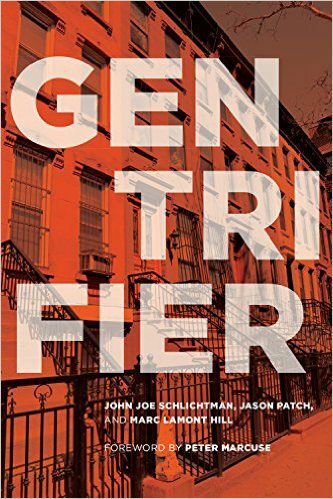 The following is an excerpt from GENTRIFIER by John Joe Schlichtman, Jason Patch and Marc Lamont Hill. The book seeks to push the limits of the dialogue relating to the theory, policy and lived experiences of gentrification. Sociologists Mary Pattillo and Michael Eric Dyson called the approach, respectively, “definitely fresh” and “a brutally honest reckoning.” One of the strands of this approach is to bring personal biography into the conversation, as this adapted excerpt about Schlichtman illustrates. “Did you end up moving to Bronzeville?” urban sociologist Mary Pattillo asked me upon finding out that I had arrived in Chicago. “‘Did you end up moving to Bronzeville’ is one of the most loaded questions you could ask me right now,” I replied. Finding a new place to live is never easy. For an academic who, like me, studies urban transformations such as gentrification, the baggage that comes with the decision could fill a moving truck. 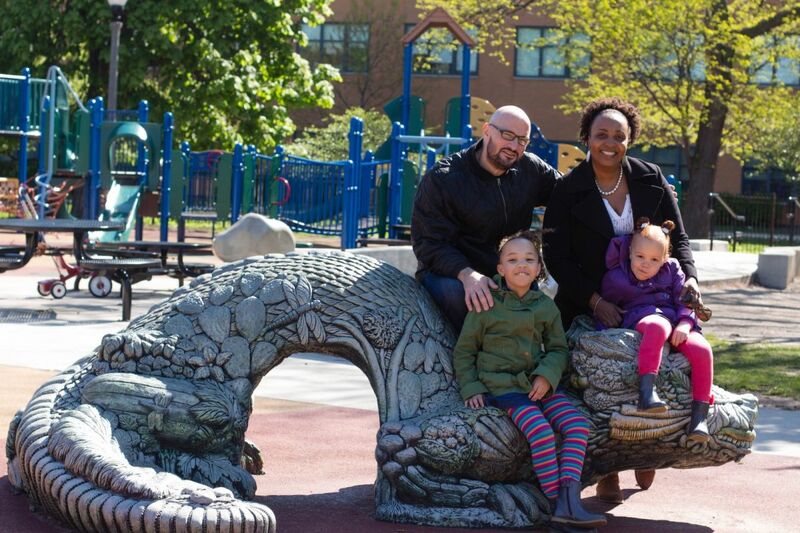 In 2012, my wife Monique and I decided to move our growing family to Chicago, where I am now a professor of urban sociology at DePaul University. We would eventually settle here with a two-year-old, a four-month-old, and a desire to adopt more children. By chronicling my attempt to make an ethical housing choice in a gentrifying city, I seek to place myself within the churning cycle of economic transformation, urban policy decisions, real estate investments, migration, demographic change and displacement that shapes our metropolitan regions. I start my story by admitting the flaw in my notion of an ethical housing choice; housing choice is always fraught with complexity. “Ethical” to one thinker is “naïve” or even despicable to another. Even within a family, definitions and frame differ. Monique is a Brooklyn-born, Black Caribbean woman who ascended from lower-working-class neighborhoods to a stable middle-class position. I am a white man who grew up in the mix of post-war, white- and blue-collar subdivisions that trail off of Chicago’s Milwaukee Avenue beyond the city limits. We relate to social structures — and our own respective place within them — differently. Monique wants our daughters to be safe from gun violence and educated in schools that are challenging. I want both of these things as well, of course. But I carry a sense of unease that our family could, in the din of everyday life, turn our backs — residentially speaking — on Chicago’s greatest challenges, namely, its deteriorating public schools and the escalating violence among its youth that touches people all around us. I came into our housing decision perhaps overly self-conscious (and academic) about our choice but I could not help but frame it within a binary: were we part of the problem or part of the solution? In some respects, that opposition burrowed inside of us. As a middle-class Black woman, Monique understood herself to be a part of the status quo or — often — the solution. And as a middle-class, white male, I often felt that my housing decisions were potentially reinforcing the problem. In segregated Chicago, this would certainly be an enduring theme within our household during all of our housing deliberations. Part of this related to what I called the “blood in the soil”: histories of immoral housing policies that demarcated, devalued and defunded Chicago’s Black neighborhoods. Like most people, we began our housing search with criteria. There was the practical pull of being on transportation lines, the community pull of being in a diverse or mostly Black neighborhood — and there were financial concerns. We also had aesthetic considerations: We liked living places with architectural integrity. These constraints pointed towards neighborhoods that were gentrifying or had already gentrified. There are blocks on the South Side on which I had friends who have since moved away. Had those friends still been enmeshed in their neighborhoods, we would likely begun our search by looking for a home in one of them. Kinship, a basis for community, would trump other facets. This had been our living situation in Bedford-Stuyvesant, Brooklyn, where we lived after getting married. There, social capital provided not only the joy of dwelling amid relationships, but also the benefit of a shared neighborhood knowledge. In Chicago, we didn’t have this option. We began looking further north in Bronzeville, a historic Black area of Chicago’s South Side. Using a real estate listing site, Monique found a home for sale near the heart of the neighborhood and asked me to visit. Built in the early 1990s, the home lacked aesthetic appeal inside and out. It had neither the look nor the material quality of its early 20th-century neighbors. But despite being a hodgepodge of old and new, the block radiated an architectural warmth. The home was affordable, its centrality to the “L” train made it practical, and it was in a predominantly Black community within which we felt our family could comfortably integrate. We decided to put an offer in on the house. The days passed and the offer was being processed. At first, we were excited. But over time, I began to think further about it. I began what amounted to an ethnography of the community. One afternoon, I ordered from a soul food restaurant, Mama Lou’s, and ate standing up in the blustery January weather because of the lack of seating during the lunch rush. There was a Jimmy John’s sandwich shop and a Starbucks, but this retail existed on the edge of a controversial, mixed-use development oriented to Illinois Institute of Technology and felt moated apart from the rest of the neighborhood. As I walked through this place where we had put in our first offer for a home, I felt like a white body signaling gentrification. The border with IIT was palpable to me. The transition from a mostly white street life to a mostly Black street life seemed to happen in a span of two blocks. Was this a tense border area, as I was perceiving? Or had my sociological framework and knowledge of the history driven me to madness? At times, I interpreted white IIT students as looking at me and seeing a symbol of safety. At other times I interpreted them as the characters of architectural renderings with all of the attendant obliviousness. Were these perceptions tainted by my school of thought? After all, oblivious to what? “Well, yes,” pushed planner Marisa Novara, “they may be oblivious that the area once marked the start of the ‘ominous’ ‘State Street corridor,’” a negatively charged term for what had been a four-mile-long stretch of public housing until a controversial demolition by former mayor Richard Daley starting in the late 1990s. Of course they are oblivious: in what context do we require residents to study up on their neighborhood before moving in? These students would likely not be familiar with 35th and State if not for the Starbucks and Jimmy John’s. Is that a good thing, if the problem previously was that non-residents feared the neighborhood and the group of young people I observed were uninhibited by that baggage? When is obliviousness the product of privilege? When is it the sign of progress? When is it the result of a well-executed plan by the powers-that-be? Like the students, I did my studying at the third place that allowed loitering for five-hour stretches: Starbucks. Here I noticed a remarkable convergence of different people, from medical colleagues to student groups to church groups to nonprofit staffs to sanitation workers. Yet the irony of a gentrifier using a Starbucks as a home base to strategize my “invasion” (in Ruth Glass parlance) was not lost on me. At times anxiety about the decision would push me to just pack up and set out walking the neighborhood. During those long days and late nights at that Starbucks (since I was without an office or a home, it served various functions of both), I found myself on the websites of the Chicago Public Schools and the Chicago Police Department. I found myself clicking through geo-coded crime data. I had never before parsed this sort of data with my own life in mind. A Pandora’s Box opened. Never before had public distributive amenities — most especially schools, but also parks — and the potential of danger played into my residential decisions. And never before had quantitative measures mattered so much. Here were the numbers. On the Chicago Public School website, I searched school graduation rates, the rate at which a school’s students pass the state exam, a school’s race and class distribution. I wanted my older daughter in a local public school. I wanted that school to be class-diverse and to have a high proportion of Black students. And I wanted that school not to be a low performer. But I also did not want to jockey to employ networks, money or status against other parents. The crime statistics were jarring because they were disjointed: I didn’t know the fabric of the block. A homicide location is less threatening when you know the area nearby and all the other activity that goes on. But I just had numbers: the number of killings, robberies, aggravated assaults and aggravated batteries on my prospective block, on my path to the train station, and in the surrounding area. We decided that we should withdraw our offer on the home. I felt that we might move to a block like this one once we knew enough people in a particular neighborhood. Monique, who was back in New York staying with the kids while I started my new job, began talking to our real estate agent Clarence about properties elsewhere. I was still living quite precariously, moving from couch to guest room in various places. The West Loop listing came from Monique. In the words of the Wall Street Journal, the neighborhood was “long known for its meatpacking warehouses and industrial feel” but had become “a hot spot” where “top tech firms, restaurants and some retailers are moving in, bringing a spate of luxury condo developments.” The listing Monique found was affordable — similar to the price of the home in Bronzeville — because the building had been more or less abandoned by the developer when the housing bubble burst. The condo was being sold through a federal government program designed to rapidly dispatch properties. Squeezing in through this door cracked open by a government program, we weren’t going to influence much displacement here. The ethics of entering into such a context felt refreshing. There was a photo of the unit’s living room included in the listing. Peering at the photo, I was shocked to see the sign for the restaurant Wishbone, where a dear mentor had met with me in the early 1990s. Near the now demolished Harpo studios, Wishbone was a place filled with much warmth for me. In my mind, it represented a considerable amount of race and class vibrancy. When I walked the area around the condo, this was still evident to some degree. The neighborhood was not the type of place I had ever thought of living, but the goings-on of this block made it an intriguing place. Walking the area as we were making our buying decision, I often saw people I knew from various aspects of my life and from all around the city — the same type of people I ran into around Wishbone in the 1990s. Inputting the home’s address into various school-related websites, Monique and I discovered that it was zoned for an academically excellent, race and class diverse public school. And searching the address in the city’s crime database revealed more property crimes than assaults. Time was short and this unit seemed to have many factors aligned in its favor. It felt right. We put in our offer. For me, settling into one of Chicago’s most intensely gentrifying zip codes was challenging. “I’ve become one of ‘them,’” I said to Monique. “What? A father?” was her retort. I felt like a lab mouse whose path had been manipulated by Chicago’s neoliberal mad scientists. My new neighborhood looks nothing like what I imagined for my family. But it’s central location makes it highly practical and there are plenty of amenities, including a new park created for the middle-class families city officials hoped to see settle there when the neighborhood had many SROs and social service agencies. In some moments, our block works. It is very different depending on the day and times. 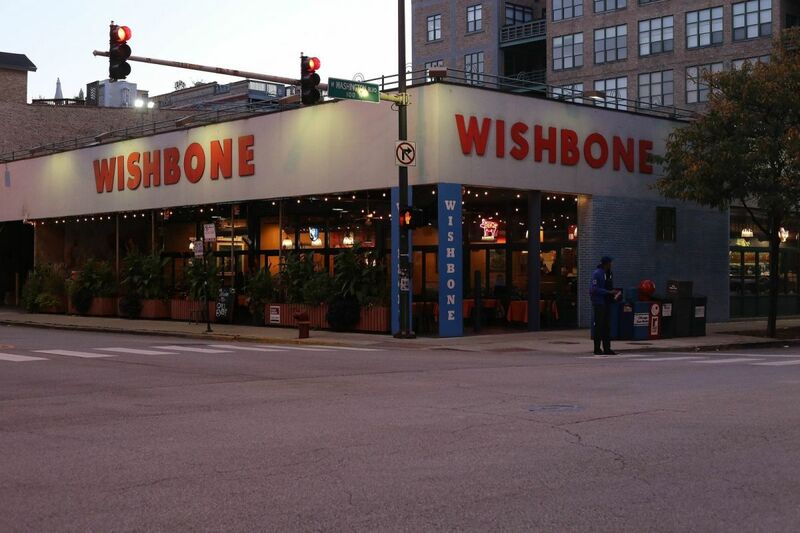 I’ve found that while the West Loop has become a bit younger and hipper, Wishbone continues to anchor a familiar community center of sorts where new middle-class residents mingle with the Sunday Black church crowd and homegrown celebrities. Monique’s Brooklyn friends, talking on the balcony during a weekend visit, exchanged hellos with the Chicago-native rapper Common as he walked into Wishbone’s Saturday cacophony of dishes clanking, laughter and car stereos playing as friends chatted outside their cars. “Do Black people live in the neighborhood?” a family friend asked. “I interact with Black people of all kinds everywhere: the grocery store, Wishbone, the street, Target,” Monique replied. “That’s completely different from a similar neighborhood in other places.” There was also the issue of policing. In the West Loop, her exchanges with law enforcement as a Black woman were pleasant; cops were used to seeing a diversity of race and class — and crime rates were low. Yet even so, push factors remain. “They don’t speak,” said Monique’s mom when I asked her and my father-in-law about the gentrification of their Brooklyn neighborhood. While Monique’s father quickly defended the newcomers, saying that he speaks with them regularly, these three words echo through my mind as I consider the West Loop. There are certainly many West Loop residents with a mind toward building community for families, but not necessarily one in which we fit. We are not really play date people. And every day, my daughters and I walk home from school saying hello and nodding to residents — many of whom ignore us. This belief, of course, was true. My daughter has 32 kids in her classroom and changing that, as Burnett implied, will only happen by burdening another kid in a more burdened school. “No matter where we are in this city,” Monique said, “the connected are going to be pitted against the unconnected.” Being zoned for a good school had not changed that. We continue to wrestle with our options, grateful that we have them. Our West Loop location has appreciated in value at the same time as properties in other parts of the city, including in Bronzeville, are declining. Had we gone through with buying the house in Bronzeville, we would be in an entirely different place financially, as (like most Americans) our primary asset is our housing. In her recent book “The South Side,” Natalie Moore notes that “failed political leadership, back-burner city status, racial perceptions and the capricious ways of capitalism have left Bronzeville as empty as some of the greystones along King Drive.” Not long ago a Black, 49-year-old city 311 operator grabbing an afternoon coffee at the aforementioned Bronzeville Starbucks was shot in the chest and killed. The target is believed to have been an employee at the neighboring Jimmy John’s sandwich shop. Like my memories of Wishbone and the new West Loop park I visit with my daughters, this horrific loss of life and the resulting images of police tape and news vans draping a Starbucks are also artifacts of this current moment in American urban history. John Joe Schlichtman is an associate professor of urban sociology at DePaul University and author of GENTRIFIER, with Jason Patch and Marc Lamont Hill. He is a member of the 2016 Next City Vanguard class.